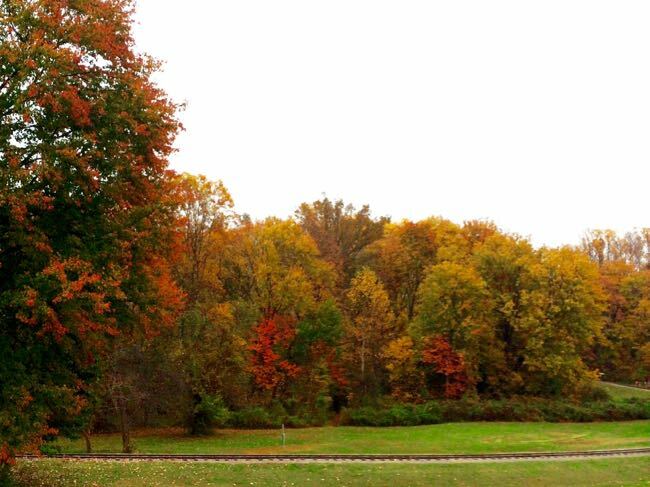 Here are 8 great fall hikes in Northern Virginia, perfect when the weather turns cooler and dryer, and the foliage puts on a show. Several of these hikes can be combined with a stop at one of our beautiful Virginia wineries and quaint towns. Hiking is one of our favorite ways to celebrate fall in Northern Virginia, and we’re fortunate to have lots of fun trails in the area. While these trails are especially pretty with Autumn colors, they are all enjoyable year-round. 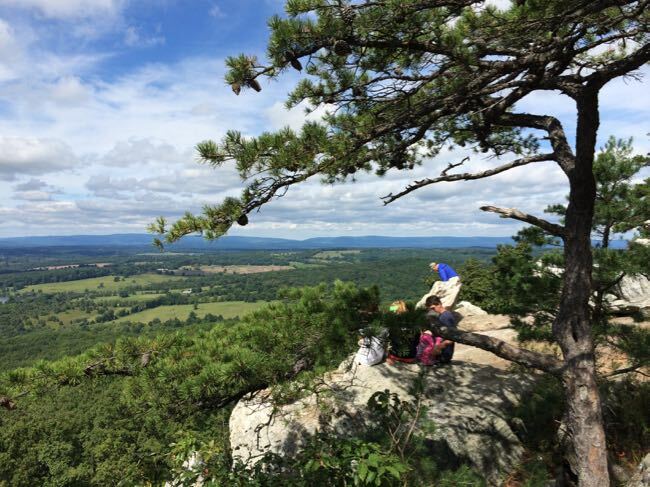 We’ve linked to more round-ups of great hikes in Northern Virginia below. Update: We’ve added Big Schloss to our list—a 4-mile hike to wonderful views from a rocky summit. This replaces the Bull Run Mountains hike since that summit is closed due to erosion. This mostly level, dirt trail along the Potomac provides continuous river views. 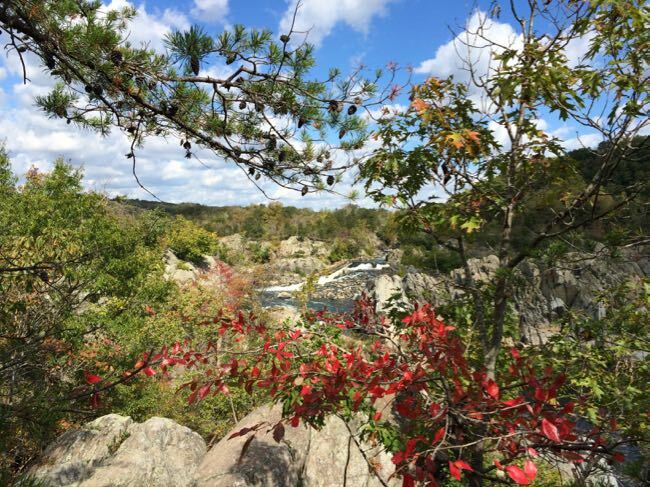 Stop at the Riverbend and Great Falls Visitor Centers to learn about the history and geology of your hike—you’ll pass a stretch of George Washington’s Potowmac Canal. Overlooks at Great Falls and Mather Gorge add dramatic views to the river’s beauty. This is a good hike for families; just turn back if the kids start to get tired. The River Trail may be closed after a heavy rain or when the Potomac River level is high. Potomac hike details. 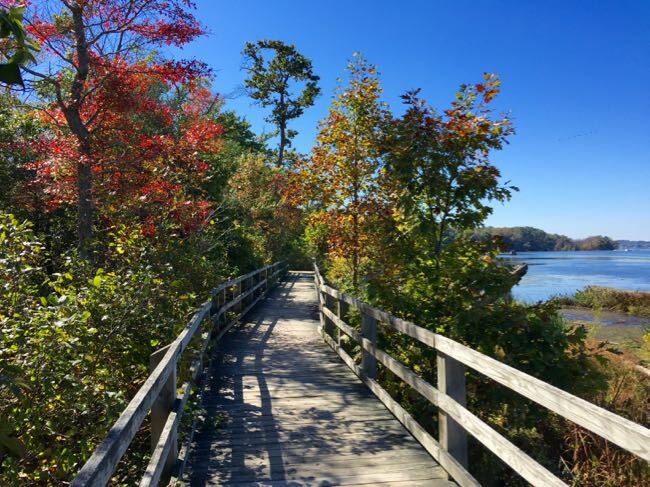 The only Virginia State Park in Fairfax County, Mason Neck offers several nice trails with bay, woods, and marsh views. It’s a wonderful location for fall hikes in Northern Virginia. The easy, quarter mile Marsh View Trail is ideal for young children or folks with limited mobility. The moderate 2-mile hike to Kane’s Creek provides a little more challenge, ending in a bird blind overlooking the marsh, where we watched bald eagles and herons (bring your binoculars). The popular Bay View Trail combines views of Belmont Bay with marsh and wooded sections in a 1-mile loop. If time allows, you can also walk the paved, 3/4-mile Great Marsh Trail, accessible from Gunston Road. Mason Neck hike details. Crisp fall days are perfect for hiking the open fields of Manassas National Battlefield, where you can immerse yourself in the details of two important Civil War battles. We hiked the 5-mile First Manassas loop, but shorter hikes are available from the Visitor Center and the old Stone Bridge. It’s not the most colorful of our fall hikes in Northern Virginia, but the open fields are lovely in Autumn. After your hike, continue your history lesson with a stop at The Winery at Bull Run. Picnickers gathered here to watch the Battle of First Manassas unfold, and some even became caught up in the action. Manassas Battlefield hike details. Burke Lake, the largest lake in the Fairfax County Park system, is an excellent destination for boating, fishing, disc golf, and cross-country running. The 5-mile trail that circles the lake is a nice NoVa hike in any season. Most of the trail is a wide, level, dirt path, with frequent places to stop and enjoy views of the lake. This is a family-friendly hike with plenty of opportunities to watch turtles, frogs, birds, and other critters. A portion of the Burke Lake trail is also stroller and wheelchair accessible. Burke Lake hike details. The Bull Run – Occoquan Trail is 17 miles long, beginning at Bull Run Regional Park in the north, and ending at Fountainhead Regional Park in the south. We like to hike the segment accessible from Yates Farm Road in the quaint and historic town of Clifton. The trail runs along Bull Run (a run is a stream) in either direction, so you can head out and back for the distance that suits you. This trail segment has the distinct advantage of ending right next to lovely Paradise Springs Winery, where you can celebrate your walk with a nice glass of wine. If it’s near meal-time, you can choose from several restaurants in Clifton center. Bull Run – Occoquan Trail hike details. Another favorite option for fall hikes in Northern Virginia are the open fields, wooded hills, and beautiful views at Sky Meadows State Park. We enjoyed a 4-mile loop hike that culminates in a gorgeous view of the valley from the Piedmont Overlook Trail. The park includes 17 miles of trails, a segment of the Appalachian Trail and a 1-mile interpretive trail, so you can choose your level of difficulty. After your hike, you can continue the views with a short drive north to Bluemont Vineyards. On our last visit, we could see the buildings of Tysons Corner from the porch at Bluemont. Sky Meadows hike details. If you’re looking for a walk along the Potomac River, Seneca Riverside Park in Great Falls provides access to a nice segment of the Potomac Heritage Trail (PHT). Seneca Tract also includes pretty wooded trails, perfect for enjoying late fall foliage. Like the hike at Riverbend Park, the riverside trail can be muddy or impassible after a heavy storm, so visit on a dry day. Another nice segment of the PHT is accessible from Turkey Run Park, which is closer to Washington DC, on the George Washington Memorial Parkway. Seneca Tract hike details. The Big Schloss trailhead is in West Virginia, but the hike straddles the border, and the peak is at least partly in Virginia, so this hike makes the cut. 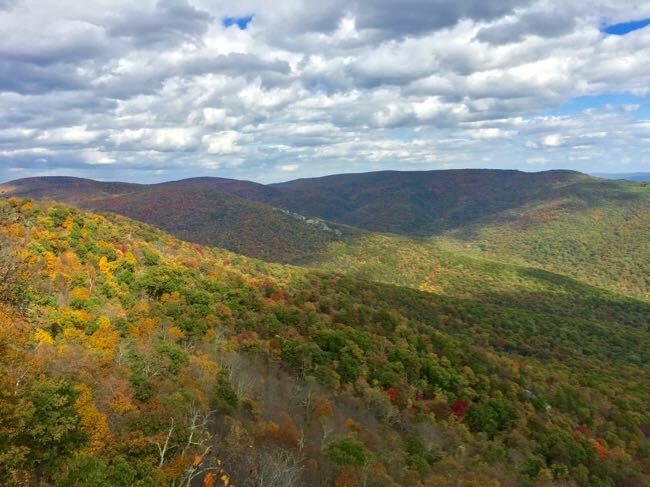 A 4-mile out and back hike, the payoff is a rocky white sandstone summit with gorgeous views into West Virginia and Virginia. The hike begins at the Mill Mountain trailhead, in the Wolf Gap Campground. The first .7 miles climbs steadily on a somewhat rocky trail; but beyond that you’ll follow a fairly level ridge until you cross a wooden bridge to reach the summit and those amazing views. Big Schloss hike details. You can explore several different trails at Bull Run Mountains, but the White Rocks Overlook is closed due to erosion (since early 2015). There are some interesting historic sites along the lower trails, including an old cemetery and quarry trench, so you can still hike in the area. However, you can’t currently reach the rocky outcropping at the end of the Bull Run Ridge Trail so you’ll miss the beautiful views west to the Blue Ridge Mountains. If you do visit, relax with a stop at the nearby Winery at La Grange after your hike. Bull Run Mountains hike details. 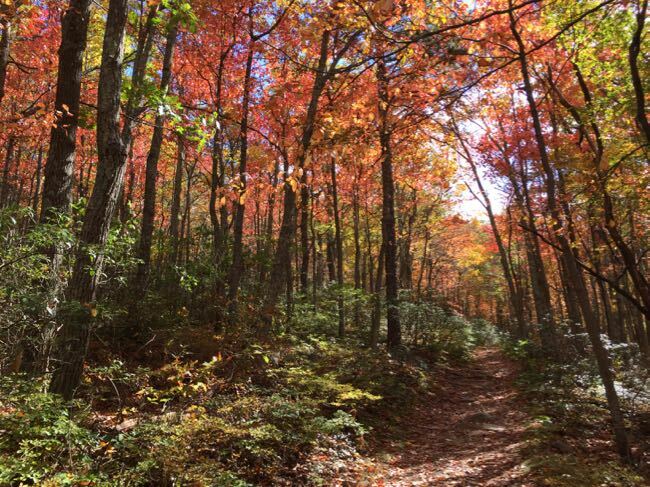 Those are 8 of our favorite Fall hikes in Northern Virginia, perfect for a crisp autumn day. Since it’s such a great season to hike, we rounded up a second batch of great Fall hikes in Virginia. Some of these NoVa hikes require a longer drive, but pretty foliage makes it worth the journey. Here are more round-ups of the best trails in Northern Virginia. Short Hikes to Gorgeous Virginia Views is perfect when you want to reach a fantastic view but don’t have a lot of time. All of these Virginia views are especially lovely sprinkled with fall foliage. 8 Epic Virginia Trails to Hike and Bike Less Than 2 Hours From DC highlights longer trails for hiking or biking in Virginia. The Appalachian Trail is longest, and the paved Mount Vernon Trail is the closest to Washington DC. These trails are great for a longer trip, but you can also enjoy a leisurely stroll on a small segment. Like many hikers, we love the idea of combining a little effort with a relaxing local beverage. Winery fans can enjoy fall foliage followed by a nice glass of Virginia wine at these 5 Hike and Wine Day Trips Close to Washington DC. 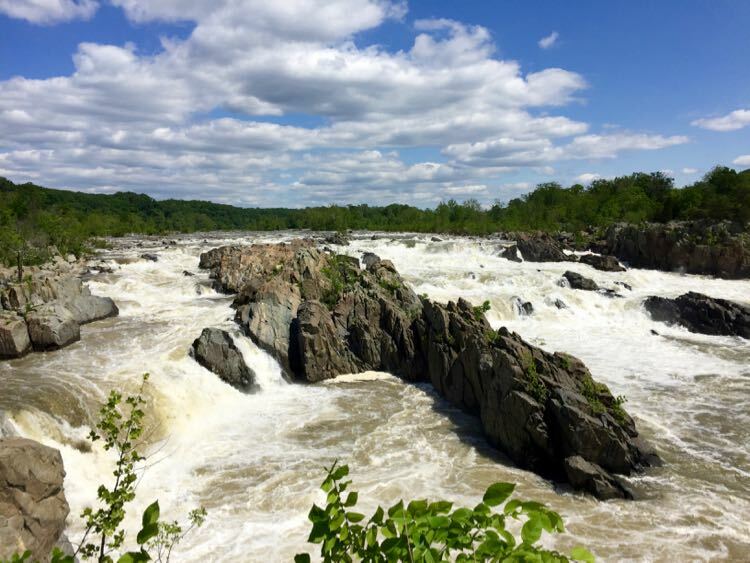 Beer lovers might prefer these 5 Hike and Beer Day Trips Close to Washington DC. Happily, most Virginia hiking trails are accessible year-round. Changes in weather encourage different trails for different seasons, though we include one favorite on all four seasonal lists. 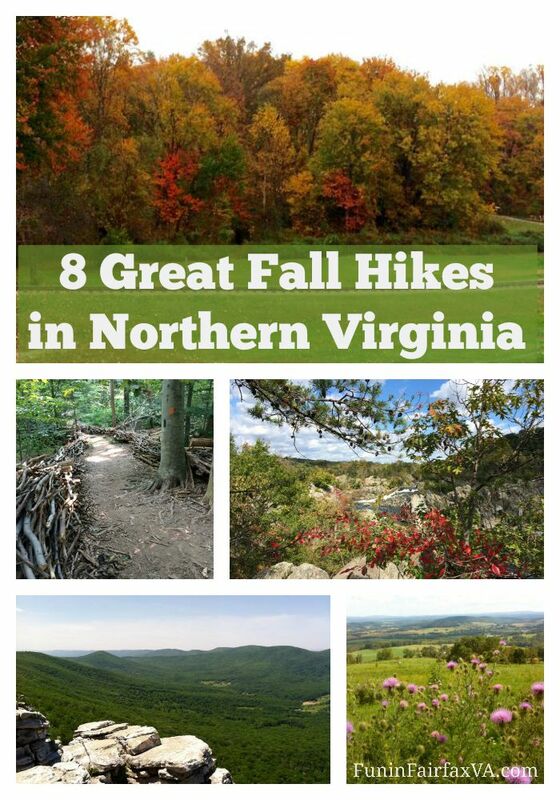 Here are 8 great NoVa hikes for every season. Got a favorite trail that’s not on our list? Please share your tips and feedback in the comments below. Whichever hiking trails you choose to tackle this fall, we wish you clear skies and happy hiking. Follow Fun in Fairfax VA on Facebook, Twitter, Pinterest, and Instagram for more great hikes, things to do, places to eat and drink, and special events in Northern Virginia and throughout the mid-Atlantic. This article was published in 2014 and updated in 2018. Thanks, as always, for the great suggestions. Shenadoah might be after peak, but these places should be really pretty right now. Thank you for the nice feedback. I haven’t made it up to Shenandoah this week but hoping to get there soon. At least when the upper summits are past peak, the valley keeps it’s color longer. Happy hiking! These are all fantastic hikes. Northern Virginia is such a gorgeous area and you cover it well. Thanks for the suggestion and the link, Trish57! Leesylvania is on our list to visit, so we appreciate the detailed hike suggestion. Thanks for sharing such a good post. All these hikes are brilliant suggestions for the hikes lover. Thank you Matt! Fall is my favorite time of year to hike and we’re finally getting some sunny days. Happy hiking to you!